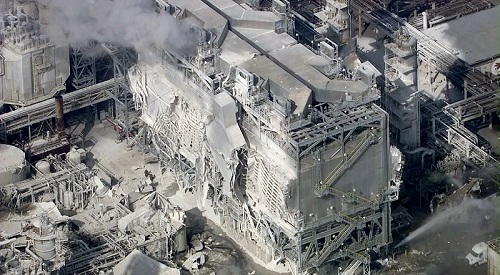 Aftermath of the Exxon Mobil refinery explosion last week. Dust residents described falling from the sky after the explosion at the Exxon Mobil refinery in Torrance, CA, last week is not hazardous but could be an irritant, company officials said. Exxon Mobil officials described the material as a catalyst primarily consisting of metal oxides and amorphous silica, which could cause irritation to the skin, eyes and throat. It said the results of its testing of the material were consistent with those of an independent test requested by the Torrance Fire Department. The explosion last Wednesday prompted the company to activate its flare system to burn off hydrocarbons as a precautionary measure, a move that resulted in fire and smoke coming from the refinery’s stacks. Exxon Mobil said it was cooperating with investigators to determine the cause and develop a repair plan. Four contractors received minor injuries in the explosion. The facility, a structure several stories tall, ended up shattered. The explosion ripped open a massive, box-like filtration unit at the refinery, the electrostatic precipitator, and spread a layer of ash over nearby homes.